"We are to meet on 18 January and exchange information." Talks on the next stage of an exchange of prisoners will begin after 18 January, the Ukrainian parliament's representative for human rights, Valeriya Lutkovska, told 112 Ukrayina TV on 10 January. "[Both parties] are updating the swap lists. We are to meet on 18 January and exchange the updated information and lists. After that, negotiations will begin on the next stage of an exchange. I deeply hope that it will be much faster because we agreed many procedures during the first stage," she said. During the previous exchange, 74 people held by separatists out the 94 requested by Ukraine were released (one woman remained in an uncontrolled territory). "Accordingly, at least 20 more people are in an uncontrolled territory. The list of those who we want to be released will probably be even longer," Lutkovska said. When asked about the fate and whereabouts of several dozen people who were requested for exchange by the militants but refused to go to the militant-controlled territory, the ombudswoman noted that each of them was in a different procedural status and "their destiny depends on that". "I am not ready to comment on their respective status, but I can say that I have not received any complaint from them about the violation of their rights," she said. 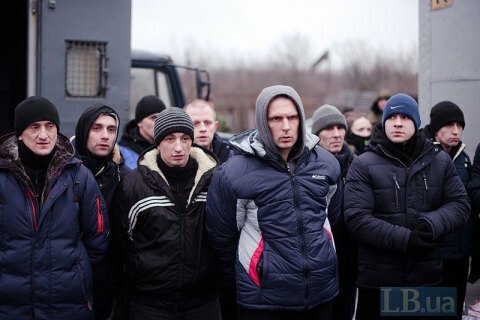 On 27 December, the exchange of prisoners under the formula "233 for 73" took place in Donbas.